Lee Woolery | Miami Valley Today Kevin Walters, shown here competing in the high jump at the Up and Running Invitational, and the Troy track and field team host the Herb Hartman Invitational Friday. Lee Woolery | Miami Valley Today Annah Stanley, shown here competing in the long jump at the Up and Running Invitational, and the Troy track and field team host the Herb Hartman Invitational Friday. 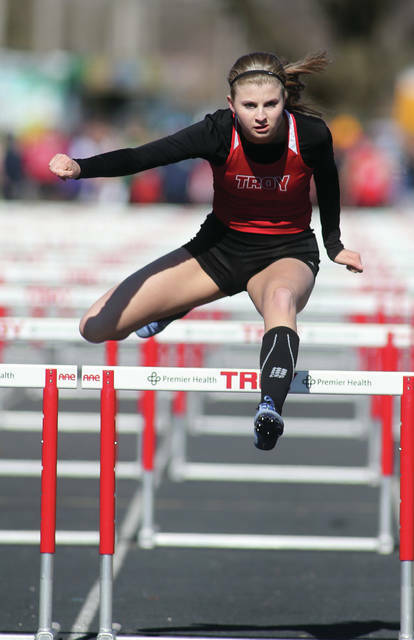 Lee Woolery | Miami Valley Today Jessica Goodwin, shown here competing in the hurdles at the Up and Running Invitational, and the Troy track and field team host the Herb Hartman Invitational Friday. TROY — The dress rehearsals will continue for the Troy track and field teams at Friday’s Herb Hartman Invitational at Troy Memorial Stadium. 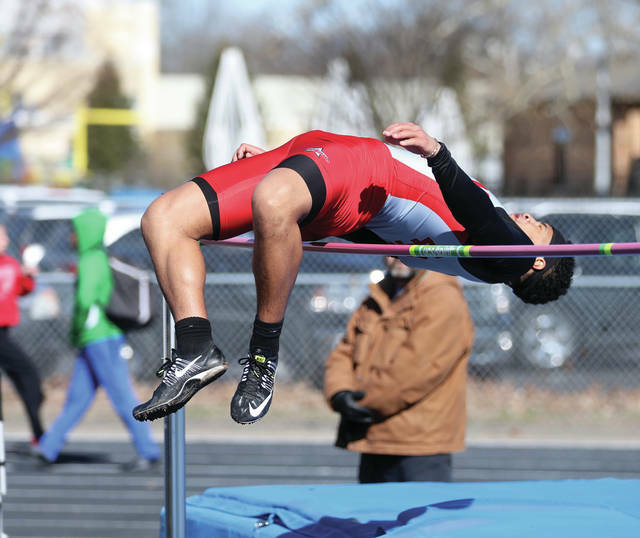 Thanks in part to poor weather, spring break and nagging health issues, both the Troy boys and girls track teams still are looking to firm up their varsity lineups heading into the Hartman Invitational, the fourth meet of the season. It’s the last meet the Trojans will host until the Greater Western Ohio Conference championships in May. Metz said that, under normal circumstances, he’d like to have a much firmer grasp on his lineup heading into the Hartman Invitational — but will make do with what he has for Friday’s meet, while hoping to learn more about his team in the process. “There have been times in years past where we’ve gone into this meet rolling,” Metz said. “I don’t know if that will be the case this year. Hopefully we can take what we’ve learned here and in the next few meets and know a little more about ourselves heading into the county meet (April 16). 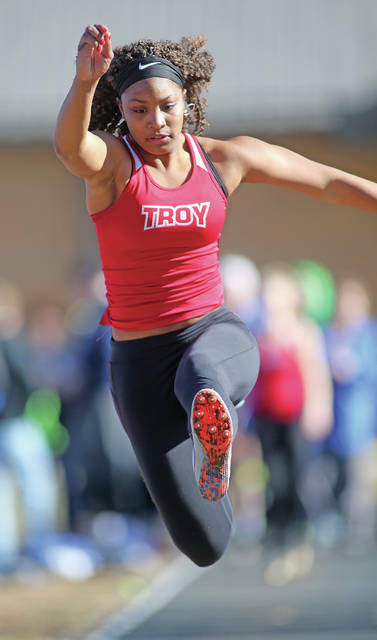 While the Troy girls team has fewer question marks than the boys team, coach Kurt Snyder still is looking for answers in several events — and hopes to find out a little more Friday. “For the most part, we are almost there; we almost have our full arsenal,” Snyder said. “We’re lucky in that our first five meets, we can enter ‘A’ and ‘B’ teams, so more kids still have the opportunity to make varsity. With that many kids getting the chance to compete, no one can complain they didn’t get their opportunity. The Herb Hartman Invitational is named after Troy’s long-time track and field coach. Hartman has spent 52 years coaching the program, both as head coach and now as the boys and girls pole vault coach. One of the annual highlights of the Herb Hartman Invitational is the steeplechase, a 2,000-meter run that includes a portion of the race in which runners have to push off a wooden barrier and leap across a water pit. https://www.tdn-net.com/wp-content/uploads/sites/21/2019/04/web1_KEVIN-WALTERS-HIGH-JUMP.jpgLee Woolery | Miami Valley Today Kevin Walters, shown here competing in the high jump at the Up and Running Invitational, and the Troy track and field team host the Herb Hartman Invitational Friday. https://www.tdn-net.com/wp-content/uploads/sites/21/2019/04/web1_ANNAH-STANLEY-IN-LONG-JUMP-1.jpgLee Woolery | Miami Valley Today Annah Stanley, shown here competing in the long jump at the Up and Running Invitational, and the Troy track and field team host the Herb Hartman Invitational Friday. https://www.tdn-net.com/wp-content/uploads/sites/21/2019/04/web1_uprunning_goodwin.jpgLee Woolery | Miami Valley Today Jessica Goodwin, shown here competing in the hurdles at the Up and Running Invitational, and the Troy track and field team host the Herb Hartman Invitational Friday.